I've finished a new page featuring a new VCO design from Thomas. It's a CD4046 based circuit that has sine, triangle, pulse, sawtooth and rampoid waveform outputs with V/oct control, exponential and linear FM and a very cool hard sync. There's the usual blather from me plus some sound samples and schematics, etc. Woo Hoo! Finally an excuse to move that 8038 VCO to vectorboard and free up my breadboard. i had the privilege to build one on breadboard end of last year. i did not build a module from it yet, though (mainly because i did not manage to source the right brand of 4046 back then). and i just have not had the time. anyways, this VCO sounds awesome. man! the hardsync is the utter madness! and i believe the "unperfect" triangle adds to it's unique sound. Better fire up the pcb layout software!! You're going to have the weight of the E-M brethern breathing down your neck for boards of this! Well it took a year to get this one out the door, but I think you'll find the wait was worth it. As usual, Scott has done a superior job of writing up the results. I think he's one of the best writers of DIY, don't you? And I hope everyone is picking up on the fact that he's providing this resource free of charge with no strings attached even though it conflicts with him replacing a defunct garage door opener. Now that's dedication! 2. Pull out the frequency counter and DVM and have at it. I used the CD4046 from National Semiconductor with no problems at all. A new mod occurred to me last night. The square wave from the 4046 tells the triangle/sawtooth circuitry when to do its thing. I wonder what would happen if that signal went through a divider first? Divide-by-two might be boring, but divide-by-three or -five might produce something interesting. Any takers? I think he's one of the best writers of DIY, don't you? I figure, if anything, if you run across a 4046 that doesn't want to get over hump, it may not matter if this design is the basis of something other than a VCO module. There are a zillion cigar box synths out there that use 555s or CD40106s for VCOs, which normally only get you pulse waves and more-or-less linear control. I think a couple of these VCOs in a box like that would be insanely cool. The divide-by sounds like an interesting thing to try out! I wanna get through this other page I'm working on working on first, though, before I try it out. And yes, the ever-industrious Fonik played a part in all this. In fact, he's the reason why I had two X-4046 VCOs to play with. Really an elegant VCO design. I agree with Thomas, Scott is one of the best DIY writers. The good news is I have a bunch of the Motorola 4046 chips which seem to work very well according to Scotts findings. Another GREAT Henry-Stites collaboration -- topnotch and very elegant as always! And super new s(t)ite(s)! The wave options look to be fantastic -- we've seen G.Richter get interesting waves out of the 4046 in the Wogglebug and I've done some similar work, but never with decent triangles or crossfading. Interestingly I was just last night thinking about square-divisions being interesting to generate new waves in similarish VCO setups. I must say, that's the best sync i've heard since the Moog Prodigy! Thanks, Bill! I've got some older MC14046s and some newer ones I ordered from Mouser (ON Semi makes the MC14046 these days). I found the older Motorola ICs easier to tune. As Studs mentioned, he had a National IC that tuned up very nicely. In my experience, the older Fairchild that I had (I don't have any "new" Fairchilds; I don't think Fairchild makes'em anymore) was quite compliant as well. For one reason or another, the TI 4046s just wouldn't play ball for me, and the few I sent to TH didn't for him either. Nor did I much care for the ST HCF4046 ICs (old or new). Tom B: I imagine one can do anything one wants with the design - it would be interesting to hear what people come up with! The idea of using the sawtooth would certainly give you a pulse output one octave above the sine and triangle outputs. Tom F: I really didn't give the hard sync much of a chance in the sample. I spent Saturday jacking around with sound samples, but it was one of those days where I couldn't come up with anything I liked musically (it was one of those days). Sunday morning I really wanted to finish the page, so I just said "to hell with it" and recorded the sequence and the waveforms to go along with it. When the sync sample came up, I just twiddled the coarse-tune of the VCO while I sausage-fingered the notes. It is a throaty-growly-screamy kind of hard sync I really like. I'll try to use it on samples for the page that's coming up next. Oh yeah: the way the hard sync is implemented is pretty cool. On the surface, it looks so obvious, but I don't think it ever would have occurred to me to use the inhibit pin in such a manner. It's downright sneaky if you think about it . It's downright sneaky if you think about it . And it comes along for free (well, all right, a transistor to protect the input). I'm glad you noticed. I have another VCO from last year itching to leave the door. It uses another equally innocuous chip (ten cents, anybody?) that does sync in almost the same way. The moral is to keep your eyes open---chip manufacturers often miss mentioning the best use of their parts. I see that an LF442 is used to drive the expo circuit. Have you tried any other type of operational amplifier such as the TL072 or LM1458? If so, had it made any difference that would disallow their use in this circuit? "...it made very little difference for the range in which my ears work. In particular, from 20 Hz to 5120 Hz the tuning was virtually identical to what I sent you on the spec sheet last night. The only difference was a bit more flatedness at 10 KHz. Conclusion: the TL is more than okay, but the 442 is better. One other thing, I had to increase the HF trim to 1M for the TL. This suggests that the TL really is better in the midrange with no prewarping needed. However, with the specified 100k and the 442 the prewarping works out much better." If one were to make a PCB it should be able to use the LM394 matched pair as well as the discrete transistors. This would give the builder choices. Just a thought. I went back to have another listen to this VCO and really like it !!! Hmm, well, there is the Quad Bass++, maybe a Quad VCO to? Would just have to manage X-Talk among the oscillators. I will probably stay away from that since I believe Tim of MS will be doing a board. scott, did you yet try the low offset LT1013 together with the matched pairs from my proto for the expo? any difference? I am impressed with the tracking since my ears can't tell a difference of +/- 10 cents and considering the error of this VCO is anywhere from 10 cents and below across the usable audio band, that is pretty dam good !! Would be curious to see how this tracks at higher and lower temperatures to see what the CD4046 control input does then. Oh Fonik, BTW, I like that amplifier also In addition, I just started using the Burr Brown "OPA" series myself in my audio and CV paths for "high fidelity" audio projects. back then i made myself a PCB for the VCO core, using LT1013 and LM394, however i have had access to TI 4046 only, so i could not get it scaled anyways. i just ordered a couple of ON Semi 4046's to resurrect this project. And the sync I recorded came from the attached picture: that's Fonik's PCB there. It has everything but the Sine output, I believe. I just hard wired coarse and fine tune pots, though you can see he put headers in for the panel connections, and Doepfer/MOTM type power connections. Tom actually started the X-4046 last year, but, at the time I was using the HCF4046, which I couldn't get going all that well. We dragged Matthias into the project to get a third eye and (IIRC) he had the same type 4046 I had(?). Anyway, during that time Fonik graciously designed and produced a PCB in what seems like no time flat. By the time we got back to brass tacks, the summer was over and Studs disappeared back into the vortex of Academia. Matthias: Last year while trying to figure things out, I replaced the LT with a TL. I never went back to the LT so I couldn't say how well it works. 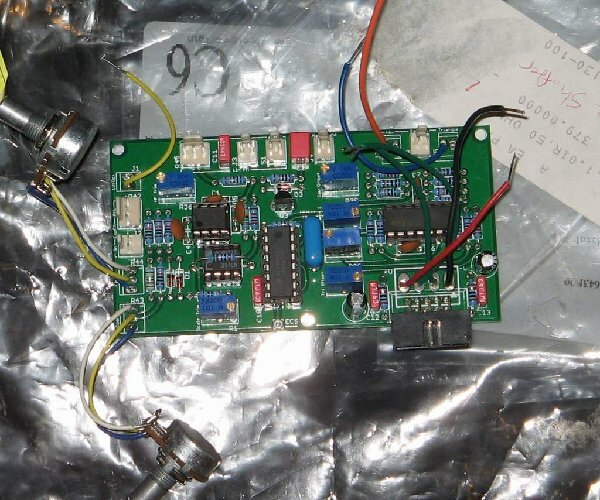 If I were to market PCBs for the VCO as a tuned VCO module, I'd almost want to supply a tested 4046 with it; I can see someone getting the PCB and plopping in a TI or HCF and starting a chain of support messages to you. But, that's just me. If either of you decided to market a PCB with an accompanyaing tested chip I would buy the set. Given the affore stated issues with different chip manufacturer's product, I second Scott's idea. Whoooaaaaaaamy gawd! This is perfect! I had bought a BUNCH of 4046's back when I was working on the design for my first Liquid HiHat. Now though, having my new design, I've still got a bunch of 4046's that had no use. And NOW, they will! Many great thanks to Thomas, Scott and Matthias for all of your work in this! O-M-F-G! I've still got a bunch of 4046's that had no use. You're a wiser man than me. About five years ago, I sold a thousand or so 4046's to someone or other for peanuts just to clear out the basement. Comes time time to do this X-4046 project and I discover I don't have any and had to order some from Jameco at full retail cost plus shipping! scott, it's great to see the boards was of use for you. If either of you decided to market a PCB with an accompanyaing tested chip I would buy the set. i won't. i think magic smoke would be the right place for such a PCB/IC set! ?